In the previous post, I listed the companies that are operating, or which have begun construction of, demonstration-scale or commercial-scale cellulosic ethanol plants in the U.S. and Canada, along with brief descriptions of these projects and the companies’ activities in producing cellulosic ethanol. In this post I’ll summarize similar projects in Brazil and Europe for the production of cellulosic ethanol, which is ethanol produced without the use of the use of food crops as the starting biomass, but instead utilizing feedstocks like wood, agricultural waste products, or municipal solid waste. For each geographical sector, the summary is organized alphabetically by company name. It is important to note that, unlike most other entries in this blog, the focus here is not the use of advanced biotechnology – although many of these companies are using genetically modified yeast strains or cellulloytic enzymes produced through biotechnology, that is not universally the case, and these posts should not be construed to imply that any company is using genetically engineered material unless explicitly stated. I’ll use the abbreviations MGY for million gallons per year, GPY for gallons per year, and MSW for municipal solid waste. The information presented here is all derived from publicly available sources. In particular, I’ve attempted to synthesize in a single location information about cellulosic ethanol plants beginning operations or under construction that has recently been published in a number of very useful summaries or online sources. Citations for these sources can be found at the end of each post: in some cases my write-up quotes or paraphrases information presented in these sources. I believe this is a comprehensive list of demo and commercial scale projects, although I’d appreciate hearing from any commenters of any omissions. Brazil has seen a flurry of recently-announced activity in planning and construction of cellulosic ethanol facilities. This reflects the significant role that ethanol plays in the motor vehicle fuel market in Brazil, but also represents a departure from the country’s historical near-exclusive reliance on sugar cane derived ethanol, in favor of a growing interest in using byproducts of sugar cane milling, particularly bagasse, the fibrous cane stalk matter resulting from processing, in cellulosic ethanol production technologies. The following are the projects of which I’m aware that are underway or planned for Brazil. Andritz AG, the world’s second- biggest maker of hydropower turbines, will furnish equipment to Brazilian sugar-cane research agency Centro de Tecnologia Canavieira for an 80 million-real ($40 million) plant that will produce cellulosic ethanol fuel from sugar-cane waste. The process will use steam to expose cellulose in fibrous biomass to enzymes that will degrade it into fermentable sugars. Discussions are reportedly underway with biotechnology companies such as Novozymes and Codexis to supply enzymes for the plant, which will be built by the Finnish engineering company Poyry Oyj. Construction is expected to begin in July 2013 and the demonstration plant will start producing fuel in the middle of 2014, at an existing mill in the city of Sao Manoel. Beta Renewables plans to build a cellulosic ethanol plant in Brazil with Brazilian company GraalBio. The first 21.6 million gallon facility in Alagoas that will use sugarcane bagasse as feedstock is expected to come online in 2014. At the Alagoas plant, the suppliers of the enzymes and genetically modified industrial yeasts are Novozymes and DSM, respectively. Cobalt Biofuels. In June 2012, Cobalt signed an agreement with Solvay-Rhodia to build a demonstration plant in Brazil for Cobalt’s process to produce n-butanol utilizing sugarcane bagasse as feedstock, which is expected to be fully operational in mid-2013. The companies expect to later form a joint venture to build a commercial plant, with a decision expected by October 2013, and plant operations targeted for the second quarter of 2015. Target capacity is up to 100,000 metric tonnes per year, or 35 MGY. Bunge Limited (through Bunge Global Innovation, LLC) has agreed to work with Cobalt and Solvay-Rhodia on a pilot plant, with additional collaboration on a demonstration scale facility and a commercial-scale biorefinery possible, to be co-located at a Bunge sugarcane mill. Edeniq, a U.S. biofuel company, announced in November 2012 that it began construction of a demo-scale cellulosic ethanol operation at a sugar cane ethanol plant owned by Usina Vale in São Paulo, Brazil. Edeniq’s process will utilize up to 20 tons per day of sugarcane bagasse, and the ethanol produced at the demo plant will be added to Usina Vale’s production at their existing plant. Inbicon recently announced a collaboration with ETH Bioenergia in Brazil that could result in a demonstration cellulosic ethanol plant in Brazil as early as 2015, with an expected capacity of several million liters per year. The plant would be co-located with one of ETH’s existing mills. Iogen is building a plant in Brazil with Raizen, which has apparently demonstrated production of ethanol from sugarcane bagasse. The plant will be co-located with Raizen’s existing factory in Piracicaba, São Paulo, but otherwise the companies have released few details about the size or timing of the plant. Although to date there has been relatively less activity in Europe directed at cellulosic ethanol production, this is expected to change in the coming years, as pressure intensifies within the European Union to move away from corn and other food crops as biofuel feedstocks. This is exemplified by the Fall 2012 European Commission proposal to cap the amounts of food-derived fuels that can be counted against the renewable fuel targets under the EU Renewable Energy Directive. The following are European projects of which I’m aware. Abengoa. Abengoa is providing its proprietary process technology and the process engineering design for a Demonstration Plant in Salamanca, Spain. The plant was completed in December 2008 and has been fully operational since September 2009. The plant capacity is 70 tonnes per day of lignocellulosic feedstock such as wheat or barley straw, with a reported capacity of 1.3 MGY of ethanol. Chempolis, a Finnish company, is operating a biorefinery to produce cellulosic ethanol and other products from a variety of non-food biomass, particularly straw and bagasse. The biorefinery, located in Oulu in Northern Finland, was opened by the Finnish Prime Minister, Matti Vanhanen on May 4, 2010. The plant can process 25,000 tonnes per year of raw material, and will also be used for testing raw materials and producing samples of bioethanol. The process is designed to be carbon neutral and low in water consumption The Chemopolis formicobio™ technology combines selective fractionation and efficient enzymatic hydrolysis followed by rapid fermentation. Clariant/ Sud-Chemie. On July 20, 2012, the company officially commissioned its Sunliquid® demonstration plant in Straubing (Lower Bavaria), Germany. The plant incorporates the entire process chain on an industrial scale, from pre-treatment to ethanol purification. It is an integrated process where a portion of the feedstock is used to grow microorganisms which overproduce enzymes which are then used to digest the rest of the feedstock. The plant, which is expected to have a 1,000 tonne/year (330,000 GPY) capacity, produced its first volumes of ethanol in July 2012. The company is currently choosing sites for first commercial plant, looking at possible locations in US, EU, Brazil and Canada, with construction planned to start in 2014 and production to begin in 2015. Inbicon. In Autumn 2009, Inbicon, a subsidiary of DONG Energy, started the construction of a demonstration plant in Kalundborg, Denmark to showcase the company’s technology for large-scale production of ethanol from straw. This plant also serves to demonstrate the ability to integrate energy with a co-localized power station. 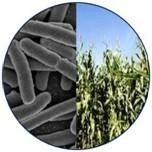 The facility uses enzymes from Dupont Danisco and Novozymes, and is operational at a capacity of 1.5 MGY ethanol. The company is also planning a commercial facility in Maabjerg, Denmark, expected to be completed in 2016, which would have a 20 MGY capacity and also use wheat straw as a feedstock. Mossi & Ghisolfi (Chemtex). In April 2011, Mossi & Ghisolfi Group (M&G) (Chemtex) commenced construction of a commercial-scale cellulosic ethanol production facility in Crescentino, Italy. This facility, which began operations in the fourth quarter of 2012, is designed to produce approximately 20 MGY of cellulosic ethanol. The plant uses an enzymatic hydrolysis process, using Novozymes enzyme technology, to convert a range of cellulosic feedstocks (such as wheat straw, rice straw, bagasse, poplar and Arundo donax) to ethanol. St1 Biofuels (Finland). ST1’s Bionolix™ plant in Hämeenlinna is the first second-generation waste-to-ethanol plant based on the company’s proprietary technology. Commissioned in 2010, the plant uses municipal and commercial biowaste as its feedstock to produce approx. 1 million litres a year of bioethanol for motor vehicle fuel use. Posted on February 25, 2013 by dglassassociates. This entry was posted in Companies. Bookmark the permalink.